Does NoMix work in real life? Pilot projects involving NoMix toilets are challenging, since these lavatories do not (yet) function as smoothly as conventional models. However, to permit further development, they need to be tested in practice. In Switzerland, four pilot projects were carried out in apartments and public buildings. It was concluded that while it is certainly possible to introduce NoMix toilets, close monitoring of the process is required. In addition, projects in private households are more problematic than in public settings. The experience gained is of great importance both for the development of the technology and for practical purposes. Every innovation has to stand the test of real-life conditions, and technologies can only be refined with the aid of practical projects. NoMix pilot projects are particularly challenging, as the toilets have to be tested by users in their bathrooms before the standards of conventional lavatories have been attained (; see also "Practical guide"). Large sanitary technology companies are reluctant to invest in NoMix toilets while the market is still limited (; Nova 2). However, a sizeable market will only arise if large-scale demonstration projects can be carried out, which in turn pose difficulties owing to the deficiencies of NoMix toilets – a catch‑22 situation. The only option is to conduct pilot projects – as best one can – using today's technology . We thank all those who participated in pilot projects for their courage in supporting the NoMix venture. Novaquatis learnt a lot from this experience. In 2001, four apartments in an urban housing development were fitted with NoMix toilets by Roediger (www.roevac.com), including a tank in the basement, on the initiative of a developer motivated by environmental concerns. The project received financial support from the federal, cantonal and municipal authorities, while scientific management was provided by Novaquatis. The aim was to study the attitudes of domestic users to NoMix toilets (Nova 1) and their functioning under real‑life conditions (see "Practical guide"). In addition, data were collected on urine volumes (Nova 3). Initially, communication with the tenants proved to be difficult, but the situation improved when a single person within Novaquatis was responsible for all contacts. In 2003, defective ceramics meant that two toilets had to be replaced – by conventional toilets, at the tenants' request: one child had had problems using the NoMix toilet, and the other household was generally sceptical. The NoMix toilets met with the approval of the other two households. However, in 2005 these also had to be replaced, as a result of defective ceramics and a malfunctioning urine outlet. As this was the only pilot project involving domestic users, the experience gained is extremely valuable for Novaquatis and the sanitary industry (Nova 2). Our feedback to Roediger was used to make improvements, e.g. to the ceramics. At Eawag, the first NoMix toilet (www.wost-man-ecology.se) was installed in 1997 and then removed in 2003 following blockages. 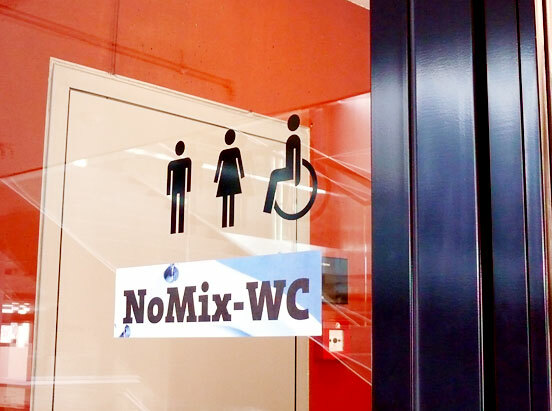 In 2000, another two NoMix toilets (www.dubbletten.nu) and three waterfree urinals connected to a tank were installed close to the cafeteria and auditorium. The urine and the installations were used for research purposes (Nova 2 to Nova 5). Social scientific studies revealed that the NoMix toilets were widely accepted (Nova 1). However, many Eawag staff in particular noted that the technology is not yet fully mature. Visitors tended to be less critical. It was essential for the sanitary installations to be well maintained; otherwise, complaints were – legitimately – quickly raised. The new Eawag office building (www.forumchriesbach.eawag.ch), which was opened in 2006, is fitted with the NoMix technology throughout. It can thus be tested on a large scale even after the completion of the Novaquatis project. From 2002 to 2004, the University of Applied Sciences Northwestern Switzerland (FHNW) operated three NoMix toilets and six waterless urinals in a vocational college . The main objective was to test various models and to gain experience. Users’ attitudes were favourable. In surveys, many respondents indicated that they were prepared to adapt their behaviour when using the NoMix toilet – e.g. by sitting to urinate (Nova 1). The functioning of the NoMix toilets and urinals was generally satisfactory. Certain urinals gave off an unpleasant odour, especially when they were not cleaned in accordance with the manufacturer’s instructions; thus, proper maintenance is essential. Low concentrations of nitrogen and phosphorus were measured in the tank – presumably because the urine was diluted with flushing water. The experience gained was very valuable when it came to designing the tank and pipes for the larger-scale pilot project IV. 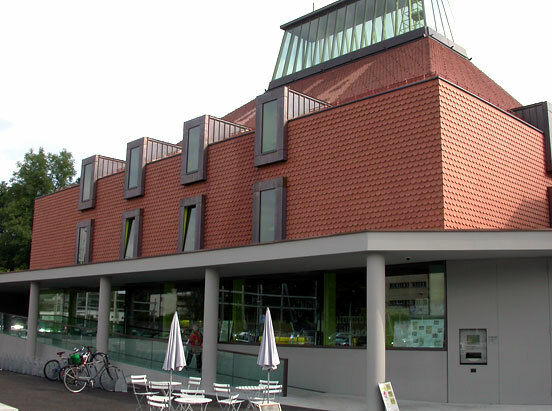 The first Swiss pilot project involving full implementation of the NoMix technology was launched by the utilities agency of Canton Basel-Landschaft (AIB) at the cantonal library which opened in 2005 (; www.kbbl.ch). The goal is to evaluate alternatives for urban wastewater management and to test the NoMix technology. This is one of the first projects worldwide to use modern urine treatment technology on a pilot-plant scale. Urine from approximately 200'000 visitors per year is stored in a tank and transported by tanker to a treatment plant, which receives financial support from the Swiss Federal Institute of Technology (ETHZ) Novatlantis project (www.novatlantis.ch). Following laboratory tests at Eawag (Nova 4), a combination of electrodialysis and ozonation was selected as the treatment process . This should permit the production of a stable, hygienized fertilizer, free of micropollutants. The product was granted provisional approval (see "Practical guide"), and it was field-tested in 2006 (Nova 6). A research institute was commissioned by Novaquatis to study user attitudes towards the NoMix toilets. The findings among the general public were as positive as those obtained in earlier surveys (Nova 1). To facilitate development of the NoMix technology, further pilot projects are required. These are complicated, costly – and risky, since any innovation can be torpedoed by adverse experience. In the longer term, therefore, improved NoMix toilets will be needed (Nova 2). In public buildings, pilot projects can be readily implemented using today’s NoMix toilets if the increased maintenance efforts are undertaken by staff. The public is prepared to use hygienic NoMix facilities (Nova 1). In private homes, however, restraint should be exercised; people are not always keen to live with the disadvantages of NoMix toilets in their own bathroom. Pilot projects in households are possible if the residents know what to expect. Ideally, these should be accompanied by social scientific studies to assess the many unresolved research questions . A clearly defined goal and early involvement of all parties will contribute to the success of NoMix pilot projects (; "Practical guide"). This innovation has far-reaching implications for urban wastewater management. NoMix pilot projects should therefore be supported by wastewater authorities and other policymakers at all levels, as well as by private investors. We hope that the experience gained from Novaquatis will encourage other actors to adopt the NoMix technology in spite of the obstacles encountered. Lienert, J., T.A. Larsen (submitted) Pilot projects in bathrooms: a new challenge for wastewater professionals. Available from: Erhältlich bei / available from: novaquatis@eawag.ch. Larsen, T.A., J. Lienert (2003) Societal implications of re-engineering the toilet. Water Intelligence Online March 2003. UNIQUE ID: 200303006. Available online. Mayer, M. (2004) Urinseparation – Praktische sanitärtechnische Erfahrungen aus 2-jährigem Betrieb einer Anlage zur separaten Gewinnung von Urin. Kurzbericht der Fachhochschule Nordwestschweiz (FHNW). Kühni, M., G. Koch, E. Ott (2002) Zukunftsweisende Sanitär- und Abwassertechnik – erstes Pilotprojekt der Schweiz für Urinseparierung, -speicherung und -steuerung im technischen Massstab. gwa (Gas Wasser Abwasser) 11/2002: 827–835.